Agriculture & urban agriculture brings food production closer to the table, decreasing emissions associated with long-distance transportation and providing communities with a greater appreciation for where food comes from. What Are the Benefits of Agriculture & Urban Agriculture? Mitigation: Local food production reduces carbon emissions associated with transporting food over longer distances. Water quality: The soil and vegetation associated with agriculture & urban agriculture can absorb rain water and filter pollutants, improving water quality in urban areas. Habitat: Flowering plants such as fruit trees and vegetables provide habitat and a food source for pollinating insects and birds. Physical Health: Urban agriculture provides fresh, nutritious food as well as opportunities for physical activity. Food Security: Local food production increases overall food security for communities by giving them access to more diverse sources of food. 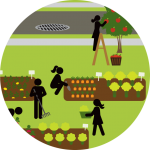 Social Well Being: Like parks and open spaces, urban agriculture provides opportunities to socialize and cooperate with one another. Education: Provides education on plant propogation, maintenance and harvesting for our children and youth. Local Economic Development: Activities related to agriculture & urban agriculture (e.g. farmer’s markets) generate business, which in turn results in local job opportunities and development.